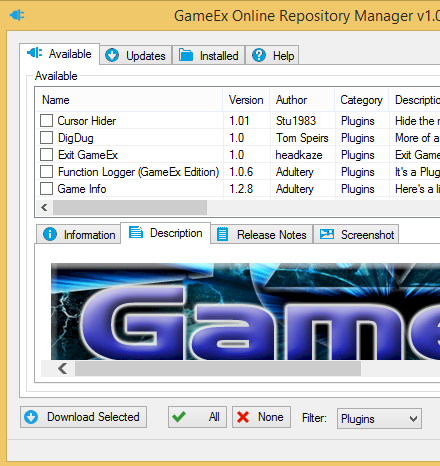 This release of GameEx brings a new GameEx online repository to the feature list with a new repository manager utility which replaces the plugin manager along with new extensions to the Setup Wizard. The GameEx repository is an online file database offering extensions, themes and other files via an API. The official GameEx repository is hosted with the forums utilising the download section and provides version control, HTML descriptions, reviews, ratings and author information. Downloads and updates to any files are automatically made available to the setup wizard and the new repository manager utility. This is an important step on the road to GameEx Evolution where we hope to have much more content shared in the repository submitted by you. You can submit your themes and other content to the repository at any time and also provide version updates. In the future we may offer a store for you to sell your content along with support for third party repositories. Free registration is required for access to the downloads in the repository and some files require an active subscription.